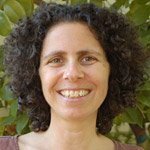 Inbal Kashtan (1965-2014), MA, CNVC Certified Trainer, was co-founder of Bay Area Nonviolent Communication (BayNVC), co-leader of BayNVC's North America NVC Leadership Program and the coordinator of the Center for Nonviolent Communication's Peaceful Families, Peaceful World Project. Inbal was the author of Parenting from Your Heart: Sharing the Gifts of Compassion, Connection, and Choice, about a dozen articles and a CD: Connected Parenting: Nonviolent Communication in Daily Life. She enjoyed developing curricular materials and processes for learning NVC, including the NVC Tree of Life, Body NVC and many journals that support deepening self-connection and integration of NVC consciousness and skills. Inbal was passionate about nurturing the development of current and future NVC leaders and exploring the application of NVC in social change arenas. She aimed to support people to integrate and live in NVC consciousness, and was continually moved by the beauty and power of the internal and group transformation that emerges from deep engagement with ourselves, with others and with life.